Slightly edited podast from the Podcasting and Videocasting Preconference at Internet Librarian 2007. 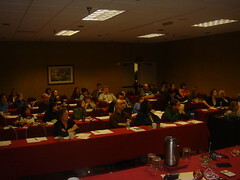 Thanks to everyone who attended the Podcasting and Videocasting Bootcamp session at Internet Librarian on Sunday. I hope everyone learned something in the session and had a good time as well. The music before the session was by Beulah. Other information from the session, including links to creation tools, slides, and additional readings is available on my wiki. Thanks again for coming! I had a blast working with you all. Feel free to email me with any questions. In the morning I'm heading out to Monterey for Internet Librarian. David Lee King and I are doing our preconference on Sunday. After that, I have no presentations or anything the rest of the conference. So it will be cool to just relax and go to sessions. And then have a couple of days of vacation time. I'm especially looking forward to seeing many of my conference/ Internet friends again. And meeting new ones. So if you see me, say hello. And watch this space for blog-style updates. Whew, I survived another birthday. And it wasn't painful at all. Thanks to everyone who sent e-cards or social networking greetings or had a beer with me. You folks are awesome. I'm really lucky to have such amazing friends. I ran across this very interesting news on the Chicago Tribune site tonight. Facebook seems to have sold a pretty small stake to Microsoft, but it is pretty huge in terms its potential growth. It is also interesting that FB partnered with Microsoft over Google or Yahoo! I wonder if long time users are going to rebel or are too committed to online Scrabble and sending fake drinks to care? I come down firmly on the side of Scrabble and drinks. Working on my presentation for IL, working on my schedule, and talking to friends about meet-ups for dinner and drinks and general catching up, is getting me back into the library world groove quite nicely after a little absence. In fact, I visited Twitter today for the first time in a long time. They've made a few cosmetic changes that look pretty nifty. I'll most likely be tweeting in Monterey, and who knows, maybe I'll keep going after that. Add me if you're going to IL. Or care about what I'm doing there. I plan on blogging from Monterey as well. And posting pics on Flickr. I honestly haven't been very excited about any of this since I moved to Chicago, so I'm looking forward to getting back into it. I know. I know. I said I wasn't going to blog anymore. But I miss typing my random observations into this little box. Ha. But seriously, I was talking to a friend a couple of weeks ago about why I quit blogging and realized that I, um, still need a place to post stuff from presentations and such. And I can't face not having a Blogger ribbon at Internet Librarian. So I am going to perhaps not retire totally from the blog world. And speaking of Internet Librarian, I'm doing the Podcasting and Videocasting Bootcamp preconference workshop with my man David Lee King on Sunday, October 28. Come join us if you want to learn about podcasting and videocasting. We'll make some fun stuff as well! There are a ton of great preconference sessions at the same time, so I'm glad I am teaching one and don't have to choose what to attend! See you in Monterey, or on the Internets!